Since writing about our project at Arizona State University’s Ceramic Research Center I’ve had a number of requests to talk in a little more detail about some of the methods and techniques that we used on the project. So I thought I would do exactly that. I’m a little late in that I had intended to publish this before we left on a recent trip to Mexico, but the clock ran out on me. Anyhow, here is an overview of some of the methods we used. 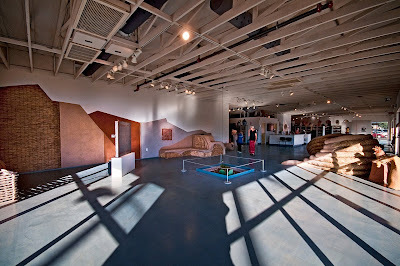 Ceramic Research Center Main Room at Arizona State University. Whenever we get a project like this in a different city, a place we know little about, the big question is always materials. The first thing on the list is always finding clay. Phoenix was pretty easy in this respect, first of all we didn’t need much clay, the second being that I knew there was a brick factory not far from where we were working. As a base material we got a yard of clay from the Phoenix Brick Yard. To round out our pallet, we brought a two 5 gallon buckets of different clays to give us variation in color. For sand I got a yard of coarse sand from a sand and gravel company, we brought with us several bags of both 30 grit and 60 grit silica sand. Chopped straw can be a problem, especially finely chopped straw, so whenever possible we bring it with us. For this project we brought two contractor plastic bags full. Once we have our hands on those basic materials we can do just about anything. The other things we used were reed mats that we find in the garden section at Lowes, several 1 inch diameter bamboo poles and the straw wattles that are used for erosion control. Those we found at Arizona Bag Company. 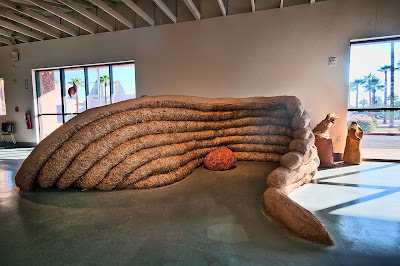 Straw wattle sculpture with Nora Naranjo Morse sculptures. Let me talk about the drywall first. It was actually fun playing with an additional layer over the original drywall. It opened up what seemed like endless possibilities of patterns and textures while adding to the interior mass of a room. I never thought I would look forward to working with more drywall, but to tell the truth, I’m definitely interested in doing exactly that. Typically, we use fiberglass tape over the joints, joint compound has given us problems in the past so I avoid it whenever possible. In this case we didn’t bother in that the project would be short lived and disassembled. We are discovering that in the art world, one has the luxury to do all sorts of things that don’t make much sense in the normal everyday world such as letting the cracks appear through the plaster. Another great thing about the drywall was playing with all the lines and angles and if you look at some of the photos you will see that the project was very much about changing lines and patterns. 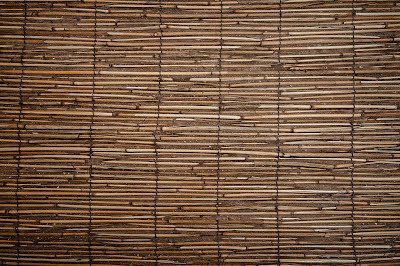 Split bamboo strips covering a strip of burlap. When permanency is an issue we like to use some sort of adhesive to adhere the clay plaster to the drywall. What we use depends upon where we are and the urgency. Away from home, little access to other materials and little time to finish we rely on concrete bonder available at most building supply outlets. Paint it on the wall and plaster over while still wet. We have been using soy resin glue available through a friend that was producing clay paints, but she has closed down her operations so that is no longer an option. Casein glue is easy to make so is probably our next choice. Call it a drywall truth window through the plaster. As for the drywall plaster mixes they were very simple. 1 part of the Phoenix Brick Yard clay to 1 ½ parts 30 grit silica sand, no straw. We typically plaster a single coat of plaster in two passes. 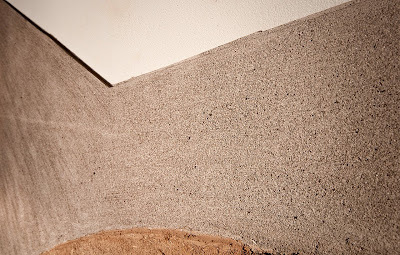 The first pass establishes the connection between the drywall and the plaster, we apply it tightly with a small amount of pressure not wanting to get an uneven build-up. The second pass, once the first has started to dry, fills in the low spots and evens out the finish. We typically thin the mix with water for this pass. If a really smooth finish is desired we’ll reduce the percentage of sand, often to as little as 50% of the amount of clay. 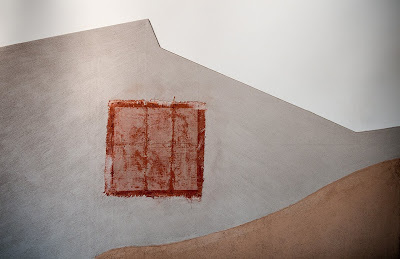 For the red plaster we used a bagged Laguna clay called C Red, ratio was 1 clay to 1 ½ 30 grit silica. You can also see an orange plaster, that was done the same way, but by blending the C Red with the Phoenix Brick Yard material. I really need to stress that these proportions are not fixed in stone and will vary depending upon thickness of the plaster and the use. The other thing to realize is that the same mix in the hands of different people may yield very different results. Application techniques play a big part in the final outcome. Sample plasters on the drywall. 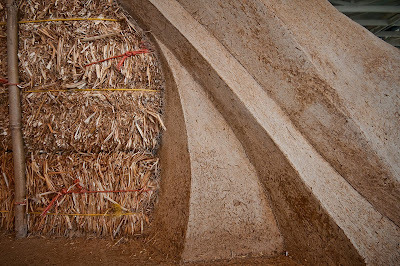 What you might call our most commonly used plaster – clay, sand and chopped straw, sponged back to reveal the aggregate and straw. We also used a couple of other small edging trowels for refinement. The Japanese have numerous tools for this purpose, they are shown in the group photo of trowels, they are available from the Landers. 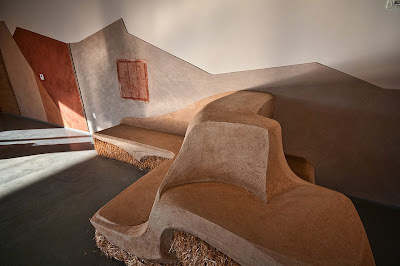 As for the plaster with the great curves on the straw bale bench we used the same mix that we use as our base coat plaster on straw bale walls – 1 part clay and 1 part chopped straw, no sand. Typically we leave the surface rough and textured for finish coats of plaster, but in this case we worked it to a smooth finish. 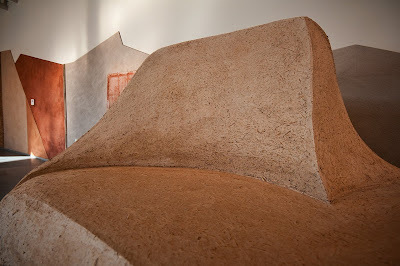 This has to be done in several stages, building it up, it is very moldable, and shaping it to whatever is desired. The first application we do with a standard rectangular wood float that we’ve cut the ends to a rounded shape like a pool trowel. 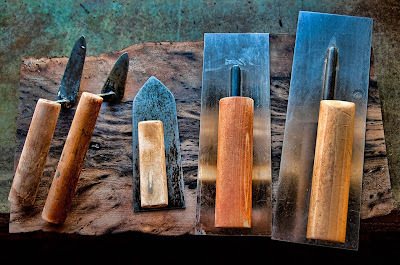 The other tool that we’ve evolved to refine and create all the curves and edges is nothing more than a small wood float made from ½ inch plywood, rectangular with a point. Overall length is about 6 inches. 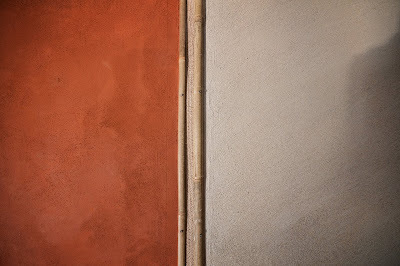 Once the plaster has set (leather-hard) so that it can still be worked without changing the shape of the plaster, we use a rigid metal trowel to compress the plaster, smooth the finish and finish the edges. The tighter the curves, the smaller the trowel that is needed. Athena used a small Japanese trowel about 6 inches in length – 150 mm on this project. From the Landers this would be the trowel. 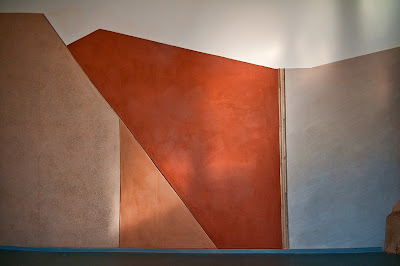 The Gray textured plaster was brushed on like a paint, two coats. The first coat was 1 part of a powdered gray clay that I got from the ceramic department of the university mixed with ½ part whiting or powdered limestone. 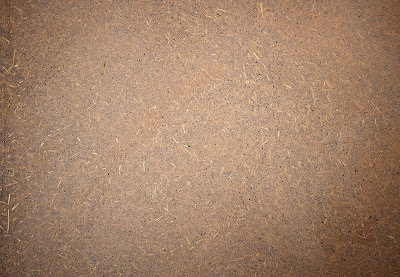 This we followed with a mix of the same clay – 1 part to ½ part of a blend of 60 grit silica sand and mica flakes, dragging the brush diagonally to add direction to the texture. The reeds we attached with our trusty Porter Cable stapler using ½ inch staples. Does a great job. For this we window screened some dirt that Athena’s aunt had used before on her project, applied it to the reeds with a rigid trowel and wiped away the excess with a yellow tile sponge to reveal the reeds. Once the clay had dried we applied a coat of 50% sun thickened linseed oil and 50% citrus thinner. Bravo ! C'est beau !!! Beautifull !!! I wan't to do it ! This is great. I was surprised to read your mixes. No fibre in some, and no sand in others. Interesting, thanks for the breakdown of the different plasters. You guys do great work.